The perfect season to go on a walk is here – fall! Out of all the four seasons in Korea, there is something special about fall. Green leaves begin to change their colors while the cool autumn breeze seems to lighten the steps of travelers. 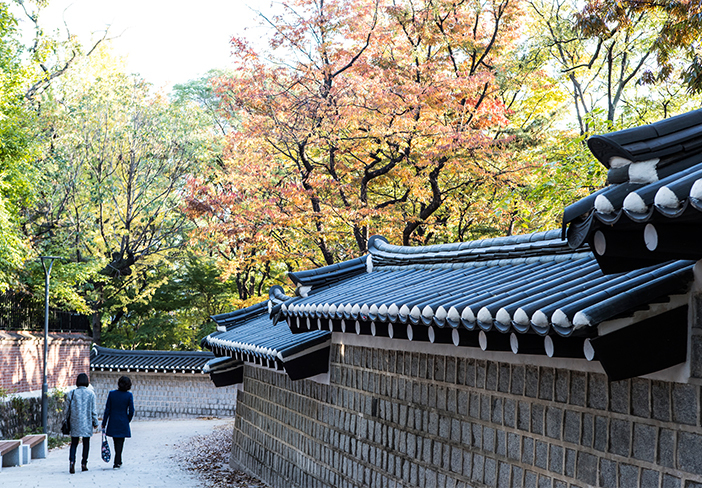 Seoul offers many streets and paths to explore, including unique alleys that will captivate your heart and walking trails that lead to a world of fascinating nature. The history of Korea and traces of lifestyles remain in every path where people have lived or passed by. Set out for a walk along one of these roads as fall approaches. Despite its location in the urbanized streets of Seoul, the many alleyways of Ikseon-dong remained rather ignored until recently. Built as a city-type residential hanok village even before Bukchon Hanok Village, it is currently the oldest hanok village in Seoul. Whereas Bukchon Hanok Village consists of large and spacious hanoks, Ikseon-dong’s hanoks are relatively simple and charming. These days, an increasing number of hanoks are being renovated into cafés and restaurants by young entrepreneurs who fell in love with the streets’ tranquil atmosphere. You can entertain yourself just by looking around the many alleys or you can choose to relax at a café with a cup of tea or enjoy a meal at a restaurant. ☞ Directions: Jongno 3(sam)-ga Station (Seoul Subway Line 1, 3), Exit 4. Walk approx. 2-3 min. Myeong-dong is one of the most popular areas in Seoul for international travelers to visit! Usually famous for shopping or street food, Myeong-dong is home to Jaemi-ro Street, a unique street dedicated to cartoons. 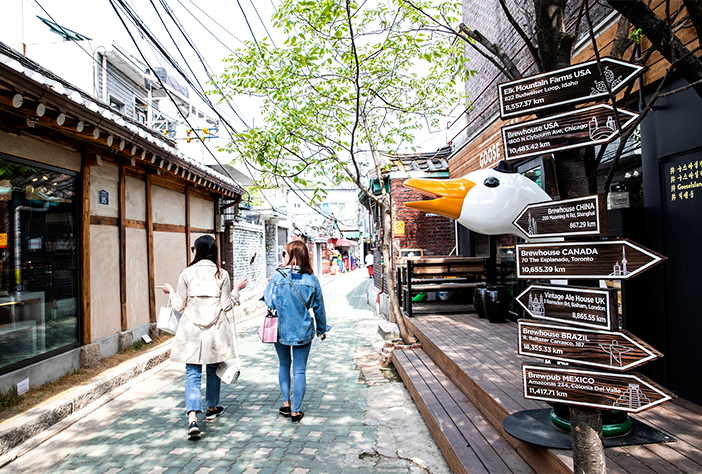 This one-of-a-kind street was created by the participation of 70 cartoonists who used their skills to create a lively and energetic mood that stands up to its name (jaemi means “fun” in Korean). Jaemi-ro Street is located in the direction of Namsan Mountain from Myeong-dong Station and is full of hidden attractions that can easily slow down any passerby. 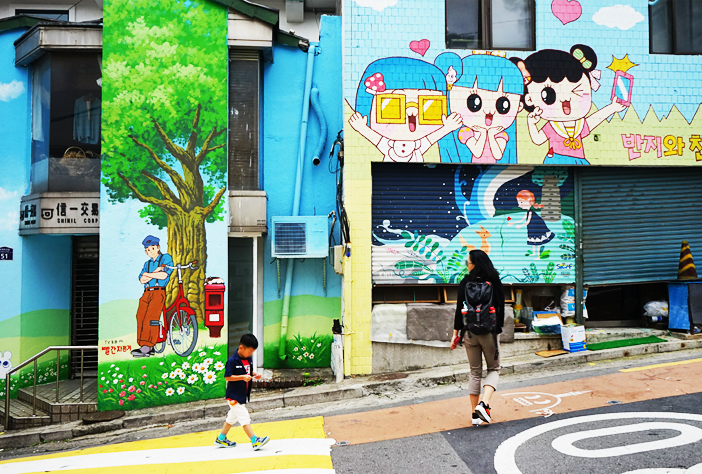 You can meet diverse cartoon characters of Korea that fill the corners and the walls of every road. You can also visit the nearby multicultural center Jaemirang and Seoul Animation Center while you explore the streets. ☞ Directions: Myeong-dong Station (Seoul Subway Line 4), Exit 3. Walk straight approx. 1-2 min. in the direction of Myeong-dong Community Service Center. 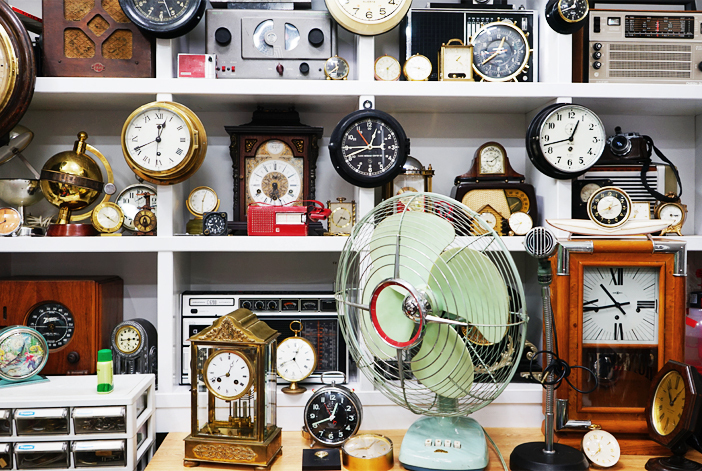 As if time has stopped in the past, the old-fashioned Yeji-dong Clock Alley seems worn out at first sight. This alley was formed when merchants along Cheonggyecheon Stream moved their shops to Jongno-gu in the 1960’s and was popular for preparing wedding gifts. Currently we can only see a glimpse of its old glory through a few of the remaining clock stores and repair shops. 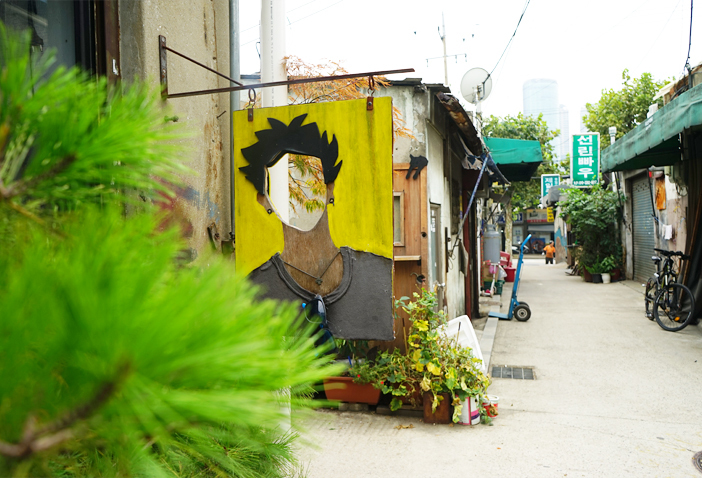 The alley is a good place to visit if want to take peek at a different side of Seoul or look at its past. Mullae-dong Shearing Alley is known as a street of art in Seoul. Packed with iron factories, these dark and gloomy backstreets began to transform into creative and artistic alleyways as artists began to move in and settle down in the 2000’s. The area of Mullae-dong Shearing Alley begins from Creative Village Information Center. Walk past the structures made of steel to find iron factories and continue to entertain yourself with diverse artworks and images embedded along each alley. There are a few things to keep in mind when visiting Mullae-dong Shearing Alley. Please be aware of your safety at all times due to trucks that often pass by with heavy loads of steel. You must ask for permission before taking pictures of people at work or the interior of the iron factories. ☞ Directions: Mullae Station (Seoul Subway Line 2), Exit 7. Walk approx. 2-3 min. 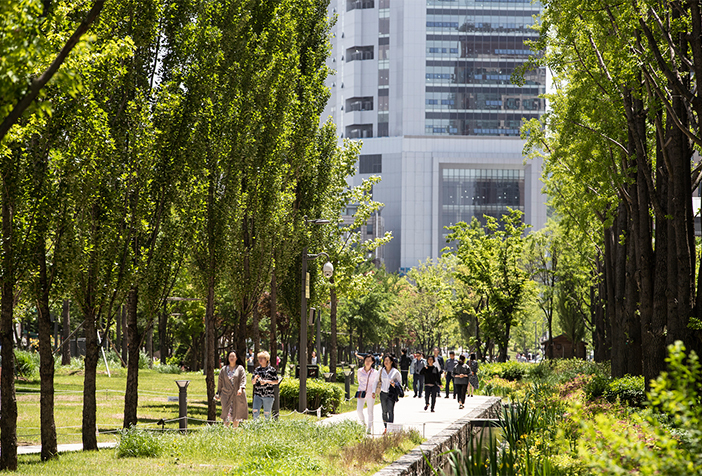 With a length of 6.3km, the area of an old railroad line was reused to create a wonderful park. 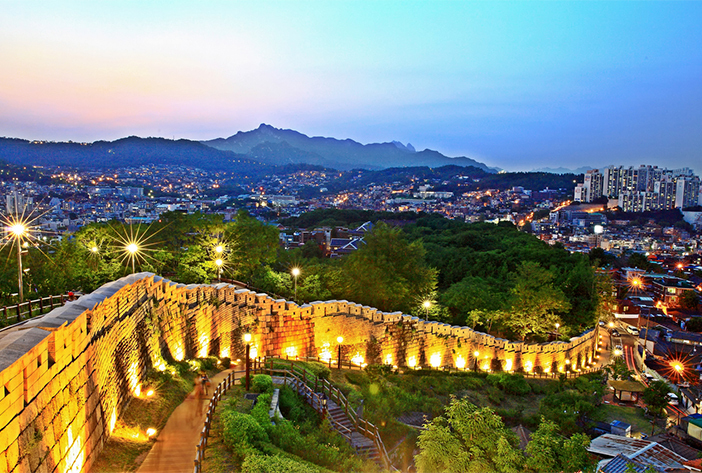 Of the three sections of the park - Saechanggogae, Waugyo, and Yeonnam-dong - the Yeonnam-dong section has gained the most popularity. Not only are you able to enjoy the pleasures of nature in the middle of a city, but you can also relax in peace at any of the several unique restaurants and cafés that you find along the way. ☞ Directions: Hongik Univ. Station (Seoul Subway Line 2, Gyeongui-Jungang Line, Airport Railroad), Exit 3. Walk approx. 7-8 min. 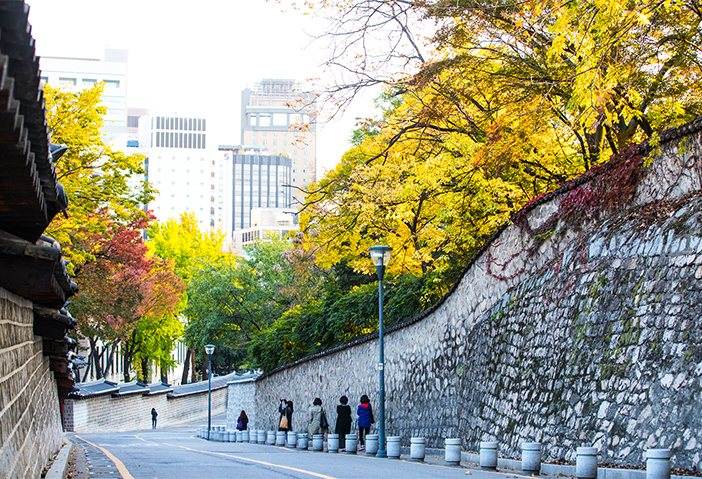 The first place in Korea that comes to mind for a walk is none other than Deoksugung Stone-wall Road. It is both the best road to walk in fall and the most famous road in Korea. Deoksugung Palace Stone-wall Road has appeared in countless song lyrics and it even has a myth saying that any couple who walks this path together will end in a break-up. The myth was known to have originated because a family court was situated here in the past, but for whatever reasons it may be famous for, its beauty lives up to its fame. The autumn landscape is especially astounding as Ginkgo and Zelkova trees along the walls go well together, offering a spectacular scene. 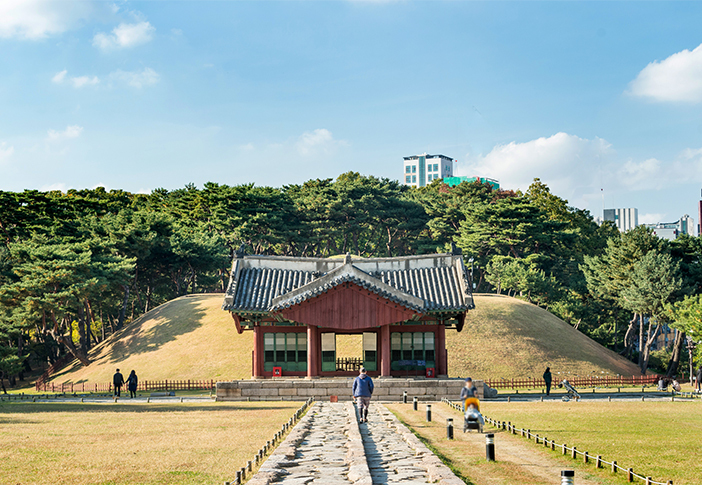 Jeongdong Observatory and Seoul Museum of Art located nearby add more great reasons to visit for cultural entertainment. ☞ Directions: City Hall Station (Seoul Subway Line 1), Exit 1. Walk approx. 3 min. / City Hall (Seoul Subway Line 2), Exit 12. Walk approx. 2 min. The trail is divided into four courses and the course most recommended for travelers is the second route, along Naksan Mountain. 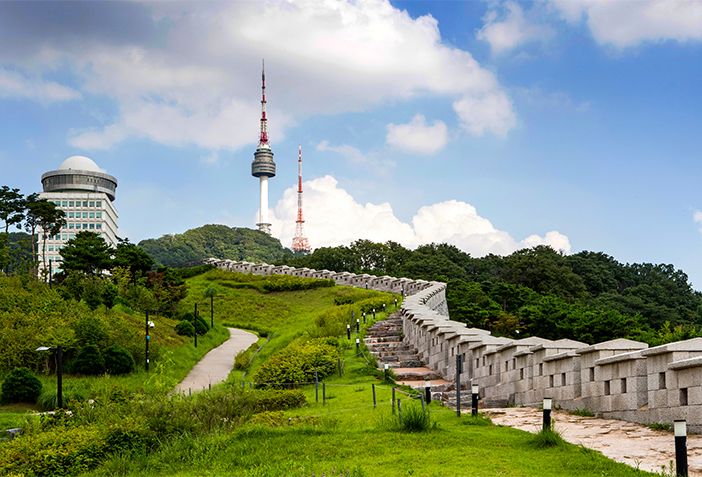 The Naksan course begins from Hyehwamun Gate, passes by Naksan Park and Dongdaemun City Wall Park, and ends at Heunginjimun Gate. With gradual slopes not too hard on one’s feet, it is a great path to take a relaxing stroll while looking around. It particularly offers a breathtaking view after sunset as vivid city lights merge with luminous wall lamps. ☞ Directions (Hyehwamun Gate): Hansung Univ. Station (Seoul Subway Line 4), Exit 5. Walk approx. 3-5 min. The term ‘metasequoia road’ brings to mind Namiseom Island in Chuncheon or Damyang, Jeollanam-do. However, one can easily enjoy metasquoias in the city of Seoul as well. The Forest of Hope built within World Cup Park is a pathway where anybody can take a nature walk in the city. Just by walking along the avenue lined with metasequoias on both sides, one can enjoy an exotic atmosphere that offers a moment of peace and stress-free relaxation. Additionally, the beautiful landscape stretching into the distances can serve as an excellent background for memorable photos. ☞ Directions: World Cup Stadium Station (Seoul Subway Line 6), Exit 1. Walk approx. 15 min. Situated among the skyscrapers of Teheran-ro Avenue; COEX Mall, busy with events; and residential apartment complexes is a ‘Green Island,’ referring to Seonjeongneung. This site holds the tombs of Joseon Dynasty’s 9th king, Seongjong (r. 1469-1494); his wife, Queen Jeonghyeon; and their second son, Jungjong (11th king of Joseon Dynasty, r. 1506-1544). The royal tomb site is populated by a dense forest of pine trees. 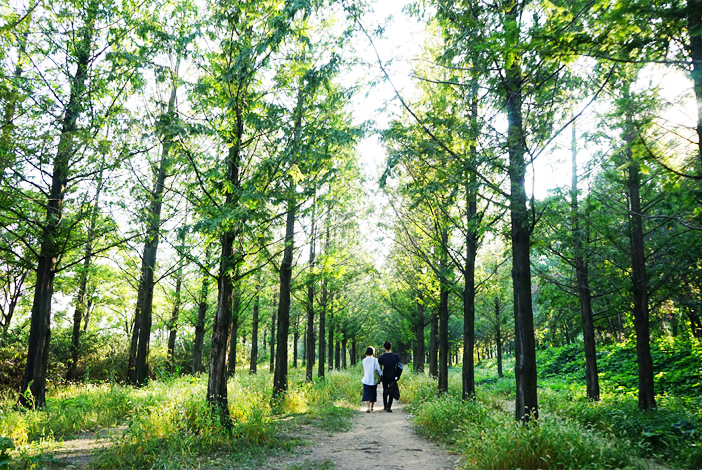 Seonjeongneung-gil Trail offers a rather different feeling from the other walking paths. Its distinctive atmosphere is fine for a walk with someone else, but it is absolutely perfect for a quiet walk alone. ☞ Directions: Seolleung Station (Seoul Subway Line 2, Bundang Line), Exit 10. Walk approx. 6 min. * This column was last updated in August 2018, and therefore information may differ from what is presented here. We advise you to check details from the official websites before visiting.